Notes: Another one of the ‘not much to say’. This baby is 100% malt focused. Choose your favorite brands and so on. The invert is 100% mandatory. You can do 100% invert 2 or 3 or the mix if you have it. The ‘3’ makes it more fruity is all. Won’t make a difference the first time along for you lot. 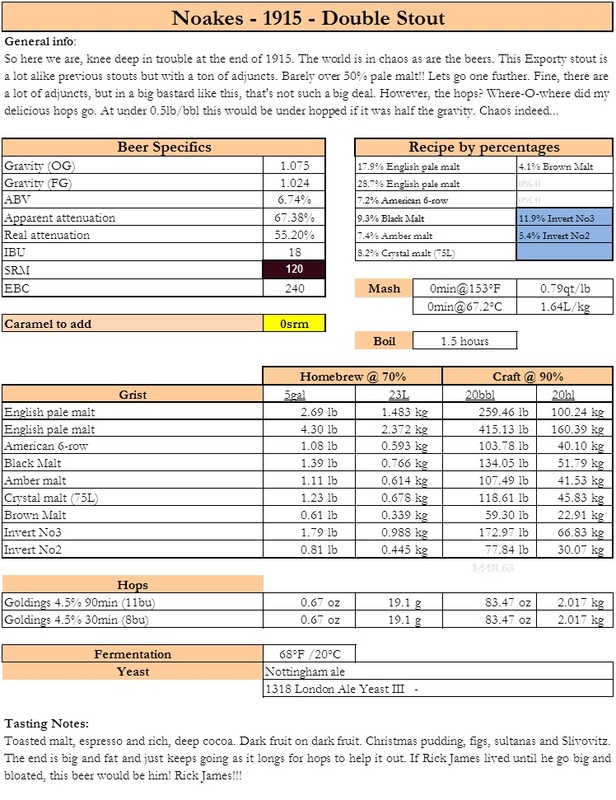 Choose a yeast that doesn’t attenuate so much. The only thing is you might have to crash cool it to ensure it finishes high. Maybe not though…your call! Should the 3rd column of the table actually say Noakes, not Courage, under "Brewer"? no, that's a Courage beer. yes, that's correct. 2.5lb/qt and 0.49lb/bbl is very very little hopping. Do we know if this beer was stored?